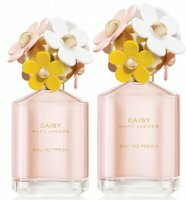 Daisy Eau So Fresh is the latest from Marc Jacobs, and it's reportedly going for a younger audience than the original (and very popular) Marc Jacobs Daisy. Daisy, which came out in 2007 (time flies!) had a pleasant and likable juice — fruity floral, but not too fruity and not too floral. It also had a well-known designer name, a young, laid-back advertising campaign, plus a massively cute bottle. It was easy enough to see why it sold like gangbusters. That anyone on earth would smell Daisy and think 'wow, that's just too mature for me' seems somewhat unlikely, but whatever: they've already done a stronger version, and now we have Eau So Fresh, the lighter version. Wisely, they made some minor, pinkifying alterations to the bottle, but they kept the design reasonably close to the original. If you were dying to own the Daisy bottle, you might reasonably be expected to want this one too. The juice follows the same trajectory. The top notes are marginally less deep than Daisy's, but they're also fruitier and sweeter: the opening is closer to a berry fruit punch, and Daisy Eau So Fresh stays fruity longer into the dry down. Daisy's floral heart was not exactly what you'd call rich, but Daisy Eau So Fresh is even lighter; it still "does a pretty good job of evoking a sunny, breezy meadow of random flowers", there's just a bit less emphasis on the flowers. The woody-musky base is likewise a bit paler and cleaner. I'm not a big fan of berry fruit punch so I prefer the original, but they're close enough to each other that it doesn't seem worth making much fuss over. If I ever buy any form of Daisy it will be because the vinyl flowers — not the fragrance — finally sucked me in. At the moment, they aren't doing sizes smaller than 75 ml, but if it sells, no doubt we'll see a rollerball and other variations. Perhaps another solid perfume ring? Meanwhile, the larger sizes make sense: Daisy Eau So Fresh doesn't last quite as long as Daisy, so presumably you'll need to reapply more frequently. Marc Jacobs Daisy Eau So Fresh was developed by perfumer Alberto Morillas and features notes of ruby red grapefruit, raspberry, green leaves, pear, violet, wild rose, apple blossom, lychee, jasmine, musk, plum and cedar. It is available in 75 ($70) or 125 ($85) ml Eau de Toilette. I do like the original Daisy, for a no-stress, just-pretty sort of wallpaper fragrance. FWIW, I don’t get any strawberry out of it; if I did, I’d probably be much less happy with Daisy. Ha! I don’t remember that, but the “eau so fresh” just kills me here. Yes I remember those toilette things !!! Daisy so fresh does indeed sound like a feminine product. Maybe they can pair up with Tampax for a total campaign. Toilet? Toilette ? Er, I think I’ve been living in perfume land too long! I use the Daisy razors! I didn’t care for Antonia either! I thought Antonia was gorgeous for about half an hour and then there was a chemical sort of undertone that became apparent to me… my girly’s usually pretty tactful when she doesn’t like something, but she came right out with “that absolutely stinks!” I am still not convinced it fit into the STINK category. Antonia smells exactly like something I used to wear wayyyyy back when, and it’s driving crazy that I can’t remember. Junior High days. Jontue? Sweet Honesty? Chloe? Windsong? L’Air Du Temps? Sadly, I can’t remember what any of them smelled like, but Antonia is really ringing some sort of memory bell. Chelsea Flowers does the same thing, but I simply can’t place what it reminds me of. Agree on the name. It’s not great. Now honestly, does she just not like it, or does she really think it smells “old”?? Admittedly, I’m probably too old to know, so I would like her input. From my viewpoint, would have thought many young people would think DK Gold “old lady” WAY before they’d think that of Daisy. And I agree on the Gold being more “mature” than Daisy, but she doesn’t. Go figure. Ok then, I stand corrected! I can sort of see that, though. There’s a fair bit of fruit in Gold, and the flowers are rich, but there’s nothing the least bit chypre-ish OR obviously made of aldehydes in it – and those are the things that I think read as “old”. Mals, that name said “feminine hygiene” to me too – I couldn’t even get past the title without going “oh, ugh”. Then the picture – is she using that as a douche? Godawful. “That anyone on earth would smell Daisy and think ‘wow, that’s just too mature for me’ seems somewhat unlikely..” exactly! My 16 yr old niece loves Daisy – though she also took a sample of L’air de Rien when she was over during the holidays. I think that marketing folks do NOT understand what young people want, and keep shoving fruity-florals down their throats. It looks like they are ramping up for wedding season marketing to me. Just enough to smell pretty in your cute little bridesmaid cocktail dress. Or, maybe I’ve hit too old for this – great for the prom cocktail dress. The ad picture is funny – is that a bottle of perfume on your crotch or are you in a feminine hygiene ad (cue the white horse)? The ad is absolutely a crackup!! Not least because it looks like she’s not wearing pants, although admit did not go look at a big version to see. Yes, riding horse without pants – big no no. Big rash, lol. The ad borders on disturbing to me, for some reason…I’m sure it’s the placement of the bottle given her pose…venturing in to his Bang ad territory here! Well, she doesn’t look very “pretty” in her face – more uncomfortable. It’s a silly ad for sure. She looks like she’s holding onto that horse for dear life. Gotta say, she’s not going to win any 4-H ribbons riding like that. Hate the feminine hygiene product name, am repelled by the ad…yes, that is pretty wretched horsemanship. I’m not being lured away from my Black Violet for this. You’ve made me realize that it is partly the pained expression on her face that reminds me of the Bang ad. How could they make the same mistake twice?? Oh, I had the same thought: it’s the female version of the Bang ad, and not in a good way, LOL! At least Marc’s girl is wearing a dress. AnnS – not only is it funny, it’s totally Freudian. As if she’s saying “My (bottle) is bigger than yours”. The pose, the shapeless white top are reminding me to schedule my yearly GYN appointment! Double :-). I need to schedule mine too. Thanks for the reminder Mr. Jacobs! Seriously?? The Daisy Eau de Parfum wouldn’t even last a decent 3 hours on me! How long could this new lighter version possibly last? 15 minutes?!? I did not try the EdP, but the regular Daisy does pretty well on me — 5 to 6 hours, although much of that is just a light musk. My husband just loves the original Diasy – even since introducing him to some amazing things I’ve amassed these past few years, so I do wear it upon occasion. Don’t have a great desire to smell this flanker, but that bottle is so cute I can hardly compose myself. If they do end up coming out with a smaller version, I WILL buy it. My husband likes Daisy, too! As in, “Come here and let me smell you,” and the sniffing turns into ear nibbling and such. I don’t geddit, I just reap the benefits. I don’t like this bottle as well as the original. So your hubby nom-noms you when you’re wearing Daisy too?! hehe I actually like this bottle about as much as the first – it has an entire bouquet of daisies! Cute bottles and I do hope they end up with smaller sizes. I’ve been giving small bottles and decants to a niece as gifts and now her younger sister is beginning to ask, “Is this the year I get perfume?” So yeah, maybe! Almost everything seems to end up in a rollerball lately, although sometimes only for a limited time. i would like the bottle in the ad!!!! Daisy was not even wallpaper material for me..(.Robin, I am still trying to love frangipani….or even just get it…(ouch…anyway i said it finally)), so I am sure osofresh will not make an imprint! Oh, but give up — life is too short to spend so much time trying to like something! You’re so kind, but I have a bottle…do pass it on to someone who needs it, I never drain anything anymore anyway. Thanks though, very much! Robin, do you find the raspberry present in the opening? Or is it more of a mash of different fruits? You know, I’ll just say “red berries” (raspberry is too specific — this just smells like berry punch) and yes, I do, more so than the original.. I love this one. Perfect spring/summer scent.